Mediterranean-Style City Living, Minutes to the Beach. City living at its best. The romance and charm of the Mediterranean, set on one of Santa Barbara's quaintest streets, in the most desirable part of town. An easy stroll to sidewalk coffee shops and cafes. The historic Mission is only 4 blocks away. Less than a mile to the heart of the shopping, dining, theater, and historic area. Two miles to East Beach - one the top 10 beaches in the United States. This Mediterranean style home is close enough to enjoy easy access to the downtown, but also provides a quiet respite after a busy day. Totally renovated and elegantly furnished throughout, the home is filled with antique elements, carousel animals, and wonderful details not found in typical rental homes. The bright, new, hand crafted country kitchen is a gourmet's delight, with Viking range, granite counters and French country sink. The Italian floor tiles flow through the large dining room, out the French doors to the secluded and quiet courtyard. The two fountains, canvas umbrellas, with dining facilities for 8-10, make for enchanting entertaining. Garden lights and portable gas heater, extend the cooler evenings. The second floor master suite with king sized bed, has an adjoining marble tiled bath with extra large shower. The suite's private, 20-foot covered balcony is ideal for reading or relaxing. The generous first floor bedrooms contain a queen sized and two single beds respectively. The single bedded room has a "library quiet" window air conditioner, for those few days every 2 to 3 years, when it might be needed. We think of it as our "cool safe" room. A bath with shower and tub is between these bedrooms. Eight beach chairs complete the package. Santa Barbara is unique. Almost everything, from world class shopping and dining, to performances and historic attractions, are within walking distance or a short shuttle ride. There are typically more activities to explore on a weekend than you can take in. The city is noted for its abundance of restaurants - highest per capita ratio in the country (just ahead of NYC and San Francisco). The Lobero Theater, Civic Light Opera, S.B. Bowl, Arlington Theater, UCSB Arts & Lecture Series, and The Music Academy of the West, are unique in supplying a constantly changing array of famous entertainment - truly unusual in a city of this size. 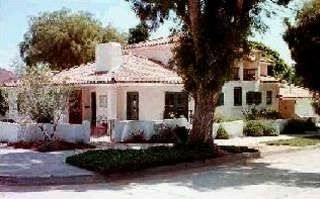 We've been renting our totally remodeled Santa Barbara home through VRBO since 2001. It has given us a chance to travel the world. We still have new countries to visit and out of the way places to explore. We've walked 500 miles in England, spent 2 months in India(and stayed healthy), and traveled throughout SE Asia. Our renters always comment on our great location and enjoyable house with great amenities. They are never disappointed, hate to leave, and of course, want to move to Santa Barbara! Santa Barbara is a city of micro climates. Our location does not suffer the coastal fog of some other locations around town and of course we enjoy an abundance of sunny days. We are able to walk to State St., the main shopping, dining, movie, coffee house area of Santa Barbara as well. The Santa Barbara Mission is also a short walk away as is the beautiful citizen maintained public rose garden. Mile walk to live theater, Art Museum, movies, and shopping. Coffee shops and restaurants within 3 blocks of house. The single bedded room has a "library quiet" window air conditioner, for those few days every 2 to 3 years, when it might be needed. We think of it as our "cool safe" room. Gas logs, in Living Room. Strong signal both upstairs and down. 60' LCD TV in Living Room; 32' Flat Screen TV in Master Suite, for viewing in bed. Dish Satellite TV. Record 5 shows at once. Sonos speakers in LR and DR. Controlled off of your phone app. Over 100,000 free radio and music sources without commercials, available on the Sonos System. Off Master Suite, second floor. Large Weber grill, attached to house gas, so fuel never runs out. Large private courtyard, for conversation and dining. Outdoor gas heater, on house gas, takes chill off evening activities. Utilities included in rental fee. Richard and Jane generously took the time to introduce us to their lovely home so that we were completely familiar with everything. Their home is perfectly situated close to downtown but also convenient to all the wonderful amenities that Santa Barbara has to offer. Inside and outside, this lovely place isn't lacking for anything and immediately became a delightful and comfortable home away from home for our nearly 2 months in town. Everything that the owners state on their house is an understatement. The property is wonderful and the owners were so helpful. Our children came up form Los Angeles and we had wonderful evenings in the backyard over barbequed prime stakes and many bottles of wine that we bought at the local vineyards. the evening were pleasantly chilly and the girl had blankets on the boys smoked cigars as we relived their childhood. This wonderful house and backyard was so comfortable for all of us we felt we were in our own home. My wife is a clean freak and the house was immaculate with helpful notes taped to appliances etc. on there operation. Santa Barbara has some of the most beautiful country we have seen in the world and the house was very near the freeways for easy access to the vineyards. There were also many different and unique restaurants in town that were LOCALLY owned. The public beaches are large, clean with lots of parking. We look forward to renting their house again next year if we are not in Europe. The city is noted for its abundance of restaurants - highest per capita ratio in the country (just ahead of NYC and San Francisco). The Lobero Theater, Civic Light Opera, S.B. Bowl, Arlington Theater, UCSB Arts & Lecture Series, and The Music Academy of the West, are unique in supplying a continuously changing array of famous entertainment - truly unusual in a city of this size. Activities nearby: Hiking, rock climbing, biking, golf, tennis, horseshoes, lawn bowling, fishing, horseback riding, shopping, restaurants, live theater, cinemas, museums, sightseeing, swimming, snorkeling/Diving, boating, sailing, water skiing, surfing, windsurfing, parasailing, jet skiing, beach picnics. One-and-a-half hour drive to Los Angeles. Available year round. No local taxes are collected on rentals of 30 days or longer.